Hydrogen gas is colorless, odorless and flammable. It forms flammable and explosive mixtures with air over a wide range of concentrations. The chief physical hazard associated with releases of the gas is asphyxiation by displacement of air and hence, oxygen. Hydrogen presents a serious fire hazard when accidentally released. Emergency personnel must practice extreme caution when approaching hydrogen releases hydrogen burns with an almost invisible blue flame which can cause very localized heating and explosion or rupture of pressure vessels. It is non-toxic. The primary health hazard is asphyxiation by displacement of oxygen. Inhalation, skin and eye contact. No adverse effects expected. .
May cause excitation, excess salivation, rapid breathing. May cause headaches and drowsiness. May cause stinging of the nose and throat. Not a likely route of exposure. None known - none expected..
RESCUERS SHOULD NOT ATTEMPT TO RETRIEVE VICTIMS OF EXPOSURE TO THIS PRODUCT WITHOUT ADEQUATE PERSONAL PROTECTIVE EQUIPMENT. At a minimum, Self-Contained Breathing Apparatus should be worn. IN ADDITION, RESCUERS MUST BE MADE AWARE OF HIGH POTENTIAL FOR FIRE AND EXPLOSION. Remove victim(s) to fresh air, as quickly as possible. If not breathing qualified personnel should administer artificial respiration. Get medical attention. IKeep person warm and at rest. No first aid should be needed. Not considered a potential route of exposure. Product is a gas.. Flammable over wide range of concentrations in air. Contact with open flames or electrostatic discharge. . Carbon dioxide, regular dry chemical, fine water mist. . Firefighters should wear the usual protective gear. Cool fire exposed containers with water spray from greatest possible distance. Remove containers from fire area if without risk. Personnel should be evacuated, if necessary, to upwind area. Unless and until flow of gas can be cut off, let the fire burn. Continue to cool containers until well after leak is stopped and fire is extinguished. Recognize that hydrogen gas is very light and rises rapidly in air, if gas is not burning, it may collect in the upper levels of structures, creating an explosion hazard. Closed containers may rupture or explode due to pressure build-up when exposed to extreme heat. Cylinders are equipped with temperature and pressure relief devices but may still rupture under fire conditions. Use a self-contained breathing apparatus. Protect system components against physical damage. Never work on a pressurized system. If there is a leak, close the upstream valve, blow down the system by venting to a safe place, then repair the leak. Use storage containers, piping, valves and fittings designed for storage and distribution of Gaseous Hydrogen. Protect cylinders against physical damage. Store in cool, dry, well-ventilated, fireproof area, away from flammable materials and corrosive atmospheres. Store away from heat and ignition sources and out of direct sunlight. Do not store near elevators, corridors or loading docks. Do not allow area where cylinders are stored to exceed 52°C (125°F). Post "No Smoking or Open Flames" signs in use and storage areas. Electrical equipment in storage areas must meet codes for Class 1 hazardous areas and be explosion proof. Move cylinders with a suitable hand-truck. Do not drag, slide or roll cylinders. Do not drop cylinders or permit them to strike each other. Secure cylinders firmly. Leave the valve protection cap in-place (where provided) until cylinder is placed into service and after it is taken out of service. Use designated CGA fittings and other support equipment. Do not use adapters. Do not heat cylinder by any means to increase the discharge rate of the product from the cylinder. Use check valve or trap in discharge line to prevent hazardous backflow into the cylinder. Do not use oils or grease on gas-handling fittings or equipment. Piped systems must be grounded. Use soapy water for leak checks, use no open flames around hydrogen systems. After use, close main cylinder valve. Replace valve protection cap (where provided). Mark empty cylinders "EMPTY". None required in normal use, only in confined spaces. .
As per OSHA29 CFR 1910.133 and local regulations. Safety boots per local regulations. Local exhaust at points of emission preferred. Exposure limit of material Simple asphyxiant. Metal oxides, metal salts, halo carbons. Gas will dissipate in air. Cylinders should be returned in the original shipping container, properly labeled, with residual product, valve outlet plugs or caps secured and valve protection cap in place. CAS #: The Chemical Abstract Service Number which uniquely identifies each constituent. ACGIH - American Conference of Governmental Industrial Hygienists, a professional association which establishes exposure limits. TLV - Threshold Limit Value - an airborne concentration of a substance which represents conditions under which it is generally believed that nearly all workers may be repeatedly exposed without adverse effect. OSHA - U.S. Occupational Safety and Health Administration. PEL - Permissible Exposure Limit - The same value as a TLV, except it is enforceable by OSHA. IDLH - Immediately Dangerous to Life and Health - A concentration from which one can escape within 30-minutes without suffering permanent injury. 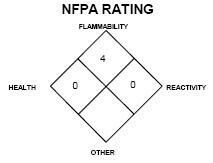 4 (Class IA flammable liquids with flash points below 23°C [73°F] and boiling points below 38°C [100°F]. 4 (materials that can detonate at normal temperatures or pressures). mg/kg quantity of material, by weight. EPA is the U.S. Environmental Protection Agency. WHMIS is the Canadian Workplace Hazardous Materials Information System. DOT and TC are the U.S. Department of Transportation and the Transport Canada, respectively, which assign DOT and TDG (Transportation of Dangerous Goods) identification numbers, hazard classifications, and proper shipping name and shipping label information. This material is hazardous as defined by 49 CFR 172.101 of the US Department of Transportation and Dangerous Goods as defined by Transport Canada Transportation of Dangerous Goods Regulations. Universal Industrial Gases, Inc. offers this information to customers, employees, contractors, and the general public to promote the safe use of this product through awareness of product hazards and safety information. Customers and others who use or transport or sell this product to others should: 1) Disseminate this information internally to all workplace areas, employees, agents and contractors likely to encounter this product; 2) Provide supplemental hazards awareness, safety information, operation and maintenance procedures to the workplace areas and employees, agents and contractors likely to encounter this product; 3) Furnish this information to all their customers who purchase this product; and 4) Ask each purchaser or user of the product to notify its employees and customers of the product hazards and safety information. Universal Industrial Gases, Inc. has taken reasonable care in preparing this document, however, since the use of this information and the conditions of use of the product are not within the control of Universal Industrial Gases, Inc., it is the user's obligation to determine the conditions of safe use of this product. The information in this document is offered with no warranties or representations as to accuracy or completeness and it is the responsibility of each individual to determine the suitability of the information for their particular purpose(s). All material contained herein Copyright 2003 / 2015 UIG.